Established in 1992 by two former Kodak employees with over 50 years of combined experience in the imaging industry, Imaging Spectrum was one of the first all-digital imaging dealers in the United States. 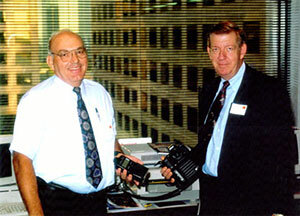 Bob Woodchek and Gary Stephens started the business in a small office in north Dallas. A metal office cabinet and the floor in the corner was their "warehouse". Likable old peddlers, Bob and Gary quickly achieved success selling new and rapidly developing digital imaging technology into the Government and Fortune 500 markets. In 1992 not many people had seen (or could afford) a digital camera or dye-sub photo printer (the first digital camera Bob and Gary sold cost $30,000, had a 1.3 megapixel sensor and was tethered to a thirty pound pack that provided power, 200MB of storage and a small monochrome screen). To help them navigate the technology and serve their growing customer base, they surrounded themselves with experts that knew the value of customer service. Over the years, with the help of devoted employees and many loyal customers, Imaging Spectrum has maintained that early lead and grown its business by providing its customers with expert technical knowledge, a friendly and reliable staff and great prices. The old school ways that Bob and Gary have instilled in every employee have served the company, and more importantly, their customers, very well. Bob and Gary have since retired and Bob's three sons share the helm.